Apples for sauce or grinding for leather - no waste. 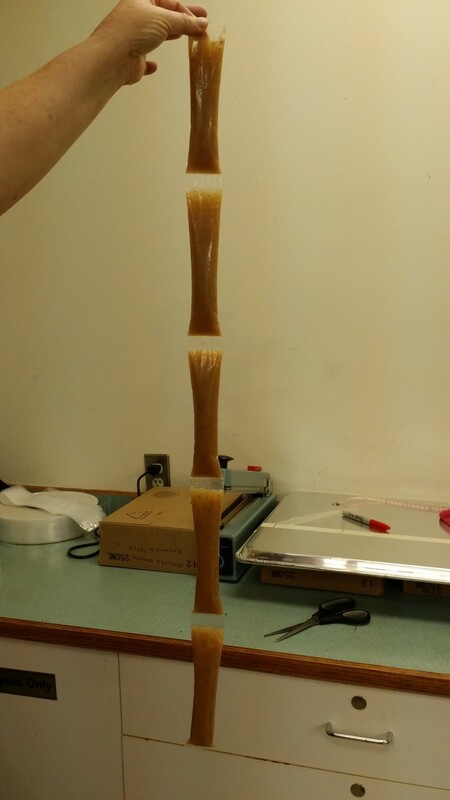 Apple sauce tubes ready for labels. Apple sauce tubes labelled and ready to go. Apples ready to go into dehydrator. Apple and banana chips waiting to be packaged. Fruit leather made from whole apples. Fruits of Sherbrooke started in the fall of 2011 with the mission of using local fruits for food. In the fall of 2015 we launched Project Fruit Stars with the mission of finding ways of getting the abundant crop of local apples to those who are hungry in our city. We are partners with E4C which is a well respected charity in the inner city. They run school snack programs and school lunch programs in 24 schools in Edmonton. Together we launched a fundraising campaign on Kickstarter to get funds to develop the program of getting nutritious snacks to kids. The name comes from two elements - good nutrition helps kids achieve in school and the star in apples when cut across the equator. Thus came the project name - Fruit Stars!! Our challenge was to make healthy snacks with no added sugar that are easy to serve to the kids. We know that there are tonnes of apples in this city that go to waste every fall and we want to turn these into food for those who need it. To extend the availability of the apples for the winter months we pulled out basic preserving skills - dehydration and freezing. 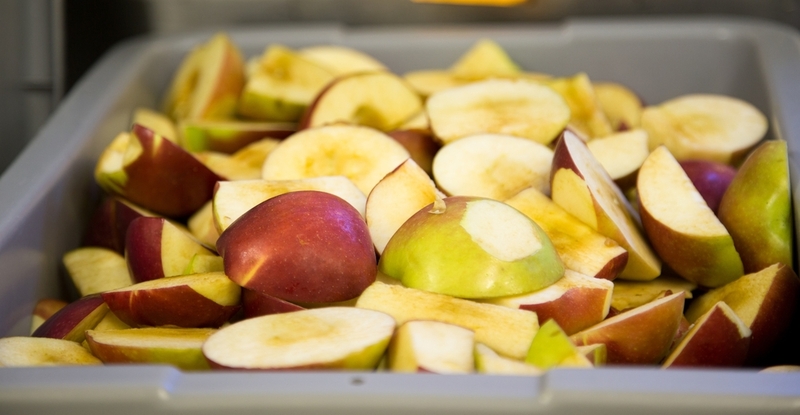 We dehydrate fresh apples to get crunchy apple chips. Since we only have 3 small commercial dehydrators, not a full bank of them (nor the space), we needed to find snack ideas that would use apples that had been frozen. This allows us to spread the work over the winter months. After quite a bit of experimenting we are on the road to getting these perfected. We grate the apples for fruit leather which is frozen until the dehydrators are again available. We also make lots and lots of applesauce because kids like applesauce. This has been our biggest challenge - figuring out how to package it so it stays food safe, is in individual servings and is easy for distribution at snack time. (I should comment at this point that we do all of this work by hand - volunteer hands.) 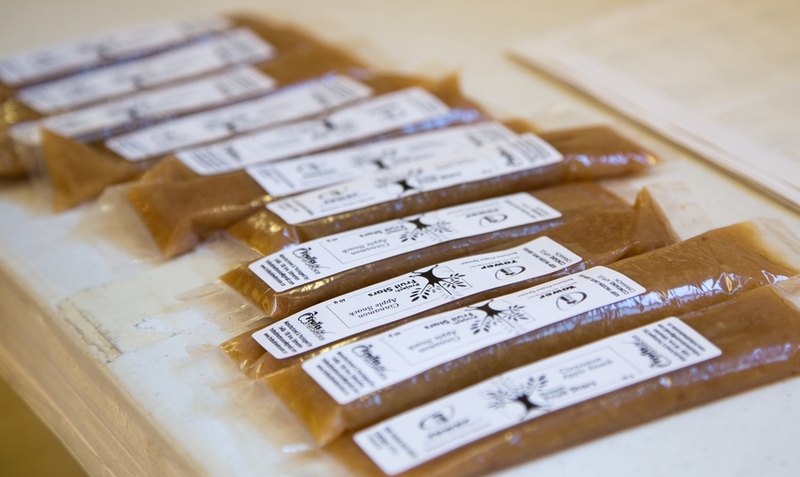 Our answer has been to create applesauce tubes - which has turned out to be a very popular treat. In addition to our local fruit, we have been gifted with apple seconds from an independent grocery store which has allowed us to keep producing well into the spring of 2016. And when we are really lucky we get bananas that are no longer marketable and and these make the ever popular banana chips! So, what is Fruit Stars? It is the creation of healthy, full-fruit snacks that are given to students as an healthy snack choice. In this project, we are all Stars! This is our reward!!! Healthy snacks for great students - everyone is a Fruit Star! !